​Do I need a visa for traveling to South Africa? There is no requirement for a visa. Just a valid passport with a few blank pages for the immigration stamps. Is there a Laundry in Bulembu? There is laundry service in Bulembu and rest assured it it excellent and totally very reasonable in cost. I just checked and our cost for Susan and I for the 2017 trip was less than $8.00. Best of all they pick it up from your room and bring it back to your room all folded and smelling good. What Vaccines are needed for travel to South Africa? These are web sites that are kept up to date and each traveler is advised to read them closely and make up your mind on what vaccines are necessary for your piece of mind. Since we will be working with hand tools and have the chance to cut our arms and hands, I highly recommend you making sure your tetanus is up to date. What about the weather in Bulembu? Click HERE to see the current weather in Bulembu. Bulembu is at about 4000 feet above sea level. Most people coming from the U. S. will find it very confortable. I have been there in July (2015), in August (2016) and in March (2017) and it felt a little cold at night in July. The rooms are not heated, but they do have a few space heaters. Always pack a rain poncho as you might catch a rainy day every once and a while. Click HERE to see the average climate for Swaziland. There were no wash cloths in our bath room; so I highly recommend you taking your own. They don't take up much space and dry over night. The bath and hand towels are refreshed every day, but they must not believe in the good old wash cloth. Swaziland, officially the Kingdom of Eswatini (/ˈswɑːzɪlænd/ or /-lənd/; Swazi: Umbuso weSwatini; sometimes called kaNgwane or Eswatini), is a sovereign state in Southern Africa. It is neighboured by Mozambique to its northeast and by South Africa to its north, west and south; it is a landlocked country. The country and its people take their names from Mswati II, the 19th-century king under whose rule Swazi territory was expanded and unified. At no more than 200 kilometres (120 mi) north to south and 130 kilometres (81 mi) east to west, Swaziland is one of the smallest countries in Africa; despite this, its climate and topography are diverse, ranging from a cool and mountainous highveld to a hot and dry lowveld. The population is primarily ethnic Swazis whose language is Swati. They established their kingdom in the mid-18th century under the leadership of Ngwane III; the present boundaries were drawn up in 1881 in the midst of the scramble for Africa. After the Anglo-Boer War, Swaziland was a British protectorate from 1903 until 1967. It regained its independence on 6 September 1968. Does Bulembu Ministries Swaziland have a Web Site? What currency will I use while I am in South Africa and Swaziland? How much currency do I need to convert? We have an ATM that we use our Debit Card to convert dollars to Rand at the beginning of our trip. It is located at the mall where we will eat our first meal in South Africa on the first night. You will not need much cash on the main mission trip and this FAQ is aimed just at the main mission trip and not at any of the excursions. Each person will need about $20 cash for tipping the drivers, including the Safari Guide. I used a VISA from Capital One for the past 3 trips for all meals, and other payments. We used it in grocery stores, gas stations and even Wine Stores. Capital One does not charge any extra fees for International Transactions. So if you convert $50 per person to Rand and pay with Credit Cards where you can you will have Rand left over. What kind of power converter do I need to take? You will need a Type M converter which will plug it into the wall outlet. Most Type M's will accept our American standard 2 prong cords. We then plug a regular old extension cord into the Type M adapter. If your device has a 3 prong cord ( 3rd prong is a ground conductor), then you may need one of those 2 to 3 prong adapters. Type M's do not convert they only adapt the physical socket to your cord. Next let's talk about needing a voltage converter. 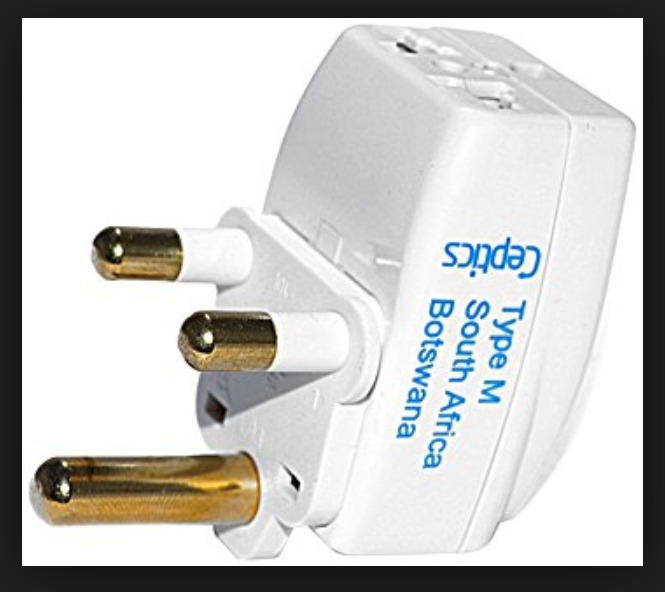 The Voltage over in South Africa and Swaziland is 230 volts at 50 HZ right out of the wall. Look at all the devices you will need to power: Phone, camera, computer and or other. There is a label on each device that will indicate the Voltage it will accept as well as AC frequency in HZ [hertz] (cycles per second). Just about all modern devices accept a range of Voltage from 100 to 240 and work between 50 and 60 HZ and therefore do not need any other converter. We take a normal extension cord and plug it into the Type M adapter and then we can plug up to three items into the other end of the extension cord. Hair dryers are different as they use a coil of wire to heat up and are usually tuned to only one voltage. I have seen so many people burn out their hair dryers on trips that I plead with you be mind full of the hair dryer dilemma. If you have to use a 110 volt hair dryer, you will have to use a voltage converter. It must be able to convert 230 volts to the 110 volts that your hair dryer uses. In 2018, we ask the Team Alpha members from 2017 to borrow their Type M's. In future years, check with Larry to see if you need to buy a Type M or if you can borrow one.